Time Remaining Until the Start of the 23rd Annual Greater Phoenix Jewish Film Festival! The Greater Phoenix Jewish Film Festival and its supporters join all to mourn the loss of the eleven Jewish citizens in Pittsburgh. Our hearts go out to their families, friends, and the Pittsburgh community as they navigate through this tragedy. Let us all join together in condemning the rising tide of bigotry, racism and hatred directed at Jewish people and other vulnerable minorities in our country, and pray for Shalom, Peace. Special guest: Introduction by Steven Ference, Ben's nephew Post-screening discussion and question and answer & answer session with Maricopa County Judge The Honorable Wendy Morton. 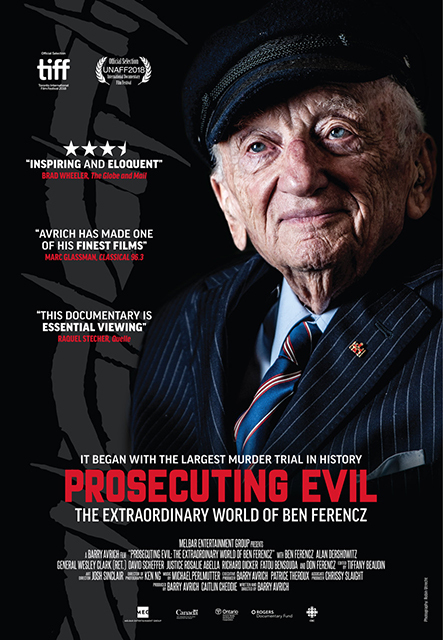 This gripping new documentary tells the fascinating story of Ben Ferencz — the last surviving Nuremberg prosecutor and lifelong advocate of "law not war." After witnessing Nazi concentration camps shortly after liberation, Ferencz became lead prosecutor in the Einsatzgruppen case at Nuremburg, which has been called the biggest murder trial in history. He was 27 years old and it was his first trial. All 22 Nazi officials tried for murdering over a million people were convicted. Ferencz went on to advocate for restitution for Jewish victims of the Holocaust and later for the establishment of the International Criminal Court. His fight for justice for victims of atrocity crime continues today. Co-sponsored by the Bureau of Jewish Education, Jewish Film Festival of Greater Phoenix, and the Phoenix Holocaust Association. To volunteer or subscribe to our mailing list, please fill out the form below. Please provide your mailing address so that we may mail you our Festival Brochure. You will also receive periodic GPJFF updates via email. Due to Harkins' renovations, the West side showing will take place at Harkins Park West, 9804 W Northern Ave in Peoria. The East Valley showing will take place at Harkins Tempe Marketplace, 2000 E Rio Salado Parkway in Tempe. We will continue to show at Harkins Shea 14 in Scottsdale. Can't wait until next year for more outstanding Jewish films? GPJFF holds special events throughout the year!